We fish all over the place! Our home turf is in central Minnesota in the Brainerd Lakes Area, but we will travel if that’s what we have to do to find the “best bite”! The Gull Lake Chain, Whitefish Chain, North Long, Pelican, Mille Lacs and Leech Lake are some of the larger lakes in our circle but there are hundreds of other awesome lakes in our book and are just calling for us to come wet a line! Gull Lake: This is my home lake and the lake we hit most frequently. 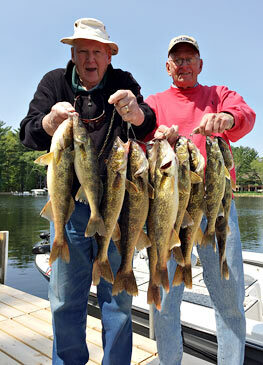 It’s loaded with all species of fish, but is most known for the walleye’s it produces year after year. Gull is loaded with structure and there are endless “spots” to fish. If the walleye bite is tough, we should be able to find something to get the rod bending. Gull Lake is where “Jingles the Fish” got her name and if you are the lucky/skillful one, you may get a crack at her and even win the Walleye Lotto!! 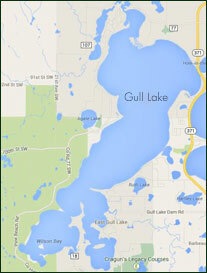 Gull Lake is about 10,000 acres of beauty above and below the surface! The underwater structure is a fisherman's dream and the scenery form above is second to none. Fishing, recreation and relaxation can all be accomplished on this awesome lake! The Whitefish Chain: This body of water (just north of Gull by about 30 minutes) is another incredible fishery. It is an all around great fishery with a lot of water to fish and many species to target. 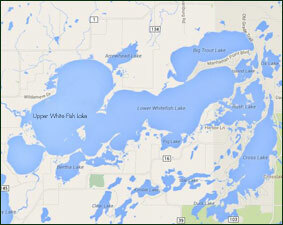 This lake is where most of our area walleye stocking is originated. Gull may have “Jingles”, but Whitefish has many of here ancestors and they are right up there in here weight category. If you want bass, they are here too (many of them!). There are even lake trout in the chain (on Big Trout Lake). This lake is awesome. The Whitefish Chain is another of God's awesome pieces of creation. This chain of lakes offers up so many possibilities for fishing and it's big enough where you can almost always find your little fishing hole away from the crowd. There are plenty of nice resorts and restaurants on the lake too. To name just a few..